My Publix trip was a little frustrating today. To start it off, I thought that my coupon trades would be in the mailbox today when I got home from work but they had yet to show up. I was really looking forward to getting some very cheap Dove Men's Body Wash and maybe even some moneymaking Poise items but I guess I will just have to run back to the store early next week and hope to grab the deals. Once I got to the store, I found that alot of items on my list were not priced as advertised in more store or were out of stock (FREE Cascadian Farms Granola Bars). I really struggled in not buying any frozen items but I am so proud of myself for resisting those aisles completely. We are doing well in our clean out the freezer challenge and in the last week or so we have eaten/cooked/used: a nine pound ham, 3 pounds of chicken, a box of puff pastry, a tub of butter got moved to the fridge, a tub of cool whip got moved to the fridge, a few pieces of frozen bread, some frozen veggies, and a package of frozen Butoni pasta. It seems like alot but I feel like we have barely made a dent. We are going to have to get much more serious about it before our Zaycon chicken arrives at the end of March. 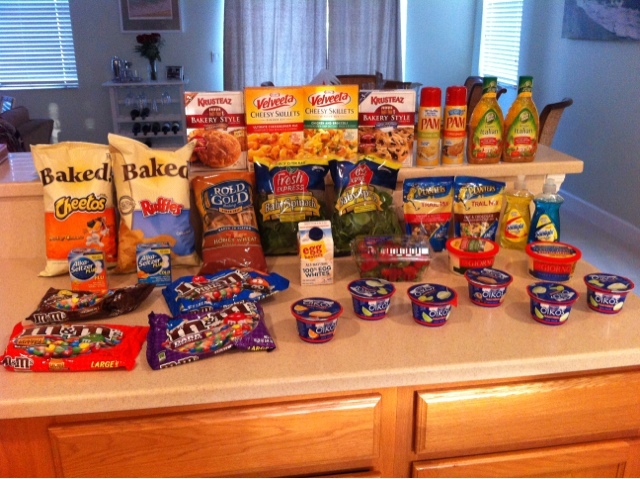 I managed to hit $65 before coupons so I used two $5/$30 Winn Dixie coupons. I spent $11 earlier this week but even so I managed to stay under $50 for the week.